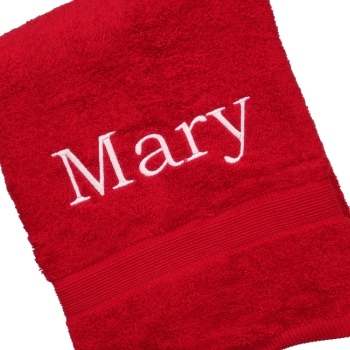 Personalised towel in deep berry red cotton bath size, a unique useful and special gift in ever popular contemporary dark red colour. You can fill in the option box and have this towel made extra special - personalised with your choice of text, including His, Hers, or a name embroidered or initials monogrammed on in a thread colour of your choice. Please note: At Amys Gifts we do all our own embroidery work especially made to order and do our best to get all orders dispatched within 48 hours.